The kids are back in the kitchen. 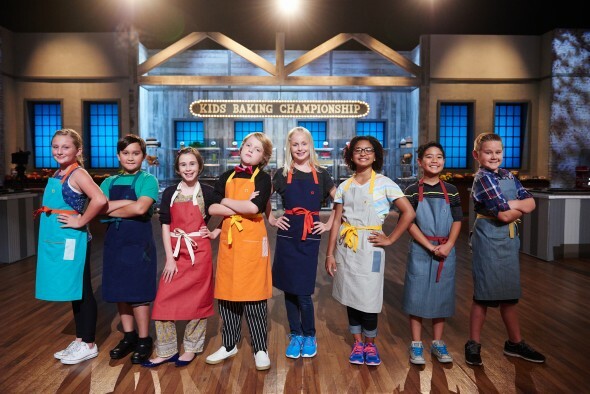 This week, Food Network announced season two of Kids Baking Championship will premiere in January. The competition series features a group of children showing off their baking and cooking skills in a series of food challenges. Valerie Bertinelli and Duff Goldman will return as judges. The new season of Kids Baking Championship debuts on January 2nd at 8 p.m. ET/PT. NEW YORK – December 5, 2016 – Valerie Bertinelli and Duff Goldman welcome a new batch of 12 impressive bite-sized bakers with tons of talent on Monday, January 2nd at 8pm ET/PT for a new season of Kids Baking Championship on Food Network. During the ten-week competition, the kid contestants (ranging in age from 9 to 12) must show off their baking skills and creativity as they whip up delectable desserts despite difficult, themed challenges such as carnival cupcakes, erupting volcano cakes, throwback treats, and the always popular challenge, dessert imposters. Only one will rise to the top to win the sweet grand prize of $25,000 to become the Kids Baking Champion! Premiering Monday, January 2nd at 8pm ET/PT “Life is a Carnival” The carnival is in town for the Kids Baking Championship kick-off! It’s a thrill ride when Duff Goldman and Valerie Bertinelli ask the 12 best kid bakers in the country to create carnival-themed cupcakes. They must try and incorporate carnival treats like kettle corn, frozen bananas and cotton candy. Premiering Monday, January 9th at 8pm ET/PT “I Lava Volcano” Prepare to be amazed as 11 bakers create volcano Bundt cakes that spew smoke and edible boulders. This red-hot challenge will test our bakers to their fiery core. Premiering Monday, January 16th at 8pm ET/PT “Comfort Food Dessert Imposters” The most beloved challenge of all pulls up a seat at the local diner. The remaining ten kid bakers must create a comfort food dessert imposter of meatloaf, fried chicken, mac ‘n cheese, and more, to keep their place at the table. Premiering Monday, January 23rd at 8pm ET/PT “Color Me Wow!” In this ode to the outrageous psychedelic colors of tie-dye, Duff Goldman and Valerie Bertinelli head back to the 1960s and ask the remaining nine mini bakers to “color them wow” with mind blowing tie-dye cakes that are so groovy, man! Premiering Monday, January 30th at 8pm ET/PT “Throwback Eclairs” The remaining eight kid bakers must update old school desserts like coconut cream pie or German chocolate cake into trendy throwback éclairs. Premiering Monday, February 6th at 8pm ET/PT “Breakfast Desserts” What happens when you cross a waffle or pancake with a layer cake? Breakfast desserts! The remaining kid bakers become royal subjects to Duff “King of Waffles” or Valerie “Queen of Pancakes”. The mission? To please their ruler with layer cakes made from waffles or pancakes. To increase the stakes, the winning side is immune from the chopping block. Premiering Monday, February 13th at 8pm ET/PT “Mobile App Cookies” Today, there’s an app for almost everything. Duff Goldman and Valerie Bertinelli provide the app names, such as Snackchat, Clash of Carbs, and Pastry Chef Go, and the remaining six kid bakers must design and create mobile app icons out of sugar cookies. Premiering Monday, February 20th at 8pm ET/PT “Pet Shop Joys” Cute little pets serve as the inspiration for this week’s challenge. The last five kid bakers standing must create a dessert inspired by the animal they are paired with: guinea pig, turtle, rabbit, mini pig or silky chicken. Sweet! Premiering Monday, February 27th at 8pm ET/PT “Molecular Kidstronomy” Kids Baking Championship goes Mad Scientist! Using futuristic tools, the final 4 bakers are fighting for a spot in the finale with molecular gastronomy-inspired desserts. Which three kid bakers will measure up in this high-tech gauntlet? What do you think? Have you seen Kids Baking Championship? Will you watch season two? More about: Food Network TV shows: canceled or renewed?, Kids Baking Championship, Kids Baking Championship: canceled or renewed?